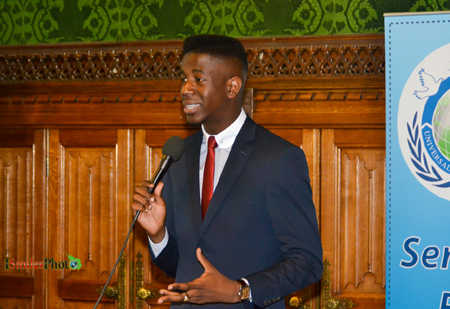 In an event packed with inspirational stories and aspirational youth one of the highlights was the Youth Achievement Award presented to the 2014 winner of ‘The Voice’, Jermain Jackman. He explained to the full Parliament Committee Room 14, that he wants to make a difference both in politics and music. He suggested that he might be the first singing Prime Minister! 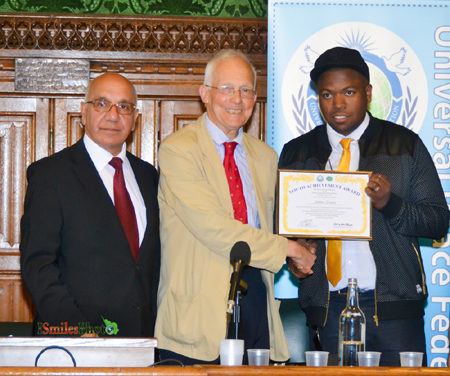 Organised by the Universal Peace Federation (UPF) – UK and hosted by its Patron, Virendra Sharma MP, the programme included presentations to ten young adults mostly by their constituency MPs. 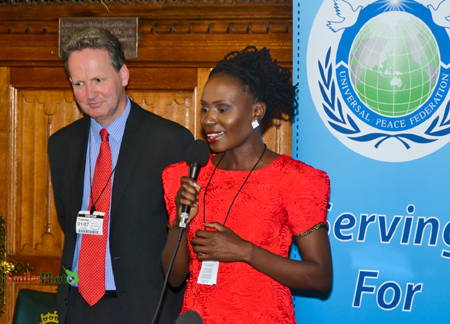 During the programme a UPF Ambassador for Peace award was presented to Pauline Long who as mentor, founder of the BEFFTA awards and entrepreneur has had a profound influence on many including Jackman. 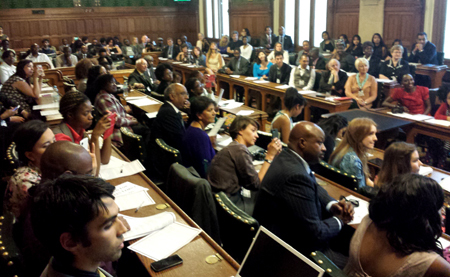 Showing the courage and faith that has made him so remarkable the 15 year old Keith Matthews Ssewamala, ] began his talk in the historic Parliamentary room giving thanks to God. Keith started battling a life threatening heart condition known as Takayasu’s Arteritis. In 2011, Ssewamala, with his mother, started a charity “the Keith Heart Foundation” (KHF) to help support children with heart conditions. Now fifteen, he is raising funds to enable a nine-year-old boy from Uganda to have heart surgery in India. They are also planning to refurbish and make the children’s ward in Uganga Heart Institute more child-friendly. As UPF recognised his achievements, he said “I thank God that I am lucky enough to have the facilities I do in this country. 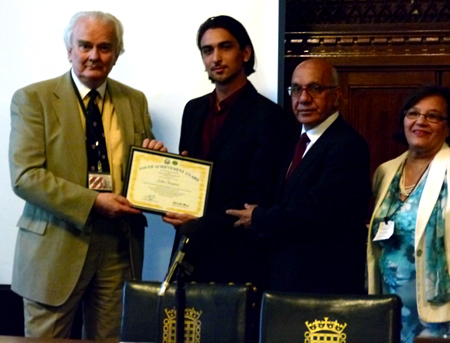 I decided that people in other nations who don’t have the luxury I do should be given the opportunity to overcome their conditions.” Lord Ahmed of Rotherham and Virendra Sharma MP presented the award to Keith and his proud Mum. Lord Ahmed commented how inspirational Keith and his family are and how they make us think of all we have and how grateful we should be. 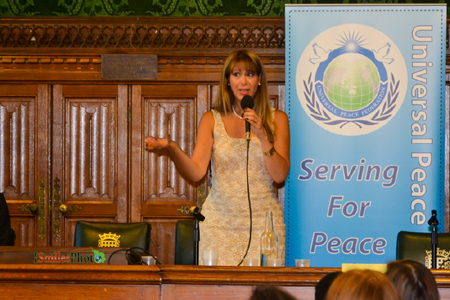 He added that his relationship with the Universal Peace Federation extends back at least 12 years and he has seen the UPF develop to do so many good works in the UK and in many other parts of the world. Naiha Masih began working with the Children’s Radio Foundation in 2013 upon attending a radio journalism workshop covering the 2020 Education Conference. She consequently used her radio skills to interview Jeremy Paxman. 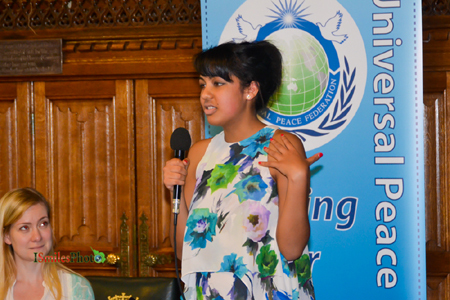 She was also elected to participate in the Annual House of Commons Youth Parliament debate where she delivered a summation speech on votes at 16 which resulted in it being the subject chosen for the Youth Parliaments national campaign that year. In February 2014, Masih travelled to Tanzania with CRF and decided to produce a radio feature focusing on the role of women’s position in Tanzanian society. She then reported about her experience on BBC Radio Oxford. She wants to use her experience to change people’s perceptions of Africa, from a continent which requires charity from the West, to a group of individual countries with people that are capable of helping themselves. This was the focus of her highly articulate, acceptance speech. After thanking God, her family and friends, Masih went on to explain what drove her to her work with the African continent was the diverse situations in Africa and the huge growth of its diverse nations. Nicola Blackwood MP added that she expected to see Naiha back in these chambers in future in a more permanent capacity! Matteo Bergamini explained he started the news magazine, 'Shout Out UK' in July 2012. 'I was only 21. We are now one of Britain’s fastest growing Alternative news networks. We aim to create a news network, which is incorporative, independent and gives a means of expression to the voiceless generation. Our Mission is to report on issues and news stories otherwise ignored by traditional media and to lift political awareness and bring worldwide news stories to young people in the UK. I started Shout Out UK as a campaign to try and get more young people involved in the political process, by making politics a compulsory subject in the UK. However, I realised that speaking directly about politics to British young people was like banging your head against a brick wall, not because they did not want to know, but because the media and the politicians themselves have created such distrusts among the next generation that young people forget how important politics is! Lord Laird presented the award to him praising the energy of youth and the need for young people to learn from the mistakes of the past in order to make a more peaceful future. Oluseyi Kolade is developing numerous projects with young people currently living in the UK and Europe. These projects include a production company that offers jobs, work experience, and apprenticeships to young people aged 16-25. Kolade’s second project is focused on appropriate sexual health, self-care and love of one’s self. She works with young women to facilitate them to embrace their personal power, fall in love with themselves, and follows their dreams by improved self-awareness and understanding what they want so they can have a great relationship with themselves and others in their lives. As a former teenage mother, she uses her experiences and her training with the NHS Sexual Health Unit to go from school to school, giving guidance to young people in a world where they are getting their identity from the hyper-sexualized modern society. Gisela Stuart MP, after presenting the award to Kolade, added that Committee Room 14 was often the place for intense debate between Parliamentary colleagues and was not as inspiring or as diverse as the meeting today. Samuel Aigbotsua was first introduced to the Gravesham youth council in October 2011 Aigbotsua was recently selected to become a Gravesham youth council Co-Optee member in the Gravesham planning and environment committee in February 2014. As part of his services to the Gravesham youth council, Aigbotsua became a member of the Medway Youth Parliament in September 2013 after moving to the area. Aigbotsua became a member of the Youth Ngage in May 2012 and took part in various community events which was run by the group. He was elected the Youth Ngage Skills and Educational director for one year and was then elected the President in September 2013. Aigbotsua has also become active in a campaign against mental health stigma and discrimination run by Rethink and Mind charities for mental health, called Time to Change. While receiving his award, Aigbotsua said that the key to success is not hiding inside one’s own dreams and personalities. “I would always sit back, but then I realized that change doesn’t come from anywhere else other than yourself, it comes from within” Mark Reckless MP presented the award praising the role of Youth Ngage and encouraging Samuel to keep going to improve the lives of people in Gravesham and Medway. Nathan Dennis is a local motivational entrepreneur Nathan Dennis who strongly believes that young people should be encouraged to dream big and aim high. Dennis, through his Company First Class Legacy, seeks to engage with some of the hardest to reach inner city young people, providing them with practical tools and tips to overcome obstacles. He has a life changing impact on their futures by helping them to believe that they can be First Class in every area of their life. Receiving the award in an upbeat and casual fashion he offered these words to those in attendance, “Only when I accepted god into his life, he could stop the madness that was in his life”, “Continue to let your light shine. Don’t let anyone define who you are. I’m nothing special, I just found some peace that surpassed all my understanding and I’m just here to say, I’m free.” While praising Nathan’s effort and desire his MP, David Winnick, added that, ‘the vast majority of young people in this country, regardless of colour, race or culture are working hard to make themselves, their family and their community proud. Lauren Turner began working this past year with Road Works Media to help young people from disadvantaged backgrounds find work by training them to use social media in a way that is most beneficial way for them. After the initial training Turner also mentors students and helps them find work by building up their self-confidence, particularly as unemployment creates negative feelings and stops youth from reaching their full potential. This has expanded into a youth internship program with the Universal Peace Federation to improve the prospects and confidence of young people. Turner is also one of the core members of the Youth UPF team who have worked on different projects both in the UK and abroad. The Rt. Hon. 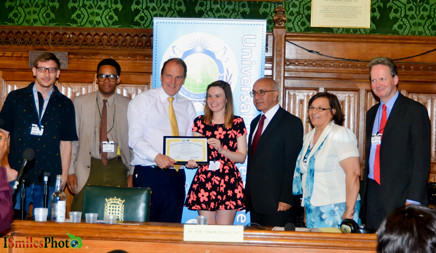 Simon Hughes MP, after presenting the award to Turner who lives in his constituency, commented that he was very inspired by her speech. He explained that the desire to help others to take responsibility and develop their lives was a service that is enduring. Neerali Pattani is an activist by heart and has used this passion to work in the community in spite of personal setbacks. She began volunteering in July 2008 with a summer camp organized by the Equality Human Rights Commission (EHRC) called ‘Our Space’. Since then, Pattani has volunteered at the National Council for Voluntary Youth Services youth forum. She is on an advisory group which acts a voice for young people to influence policy decisions on areas of NCVYS’s youth participation work. She also volunteered for the 2012 Olympic/Paralympic Games. She participated in an Active Citizens Programme that inspired her to tackle a major issue youth misbehavior issue in her area. Pattani and her sisters connected people who had had a negative experience and started a petition. They held meetings with the police, local authorities, Councillor Manjula Sood and the Mayor of Leicester Sir Peter Soulsby which had positive outcomes such as a good relationship with the local police, better street lighting and introducing a Section 31 ban in the area. The Pattani with other youth members of the community has since created an event called “Sunday Fun Day”. 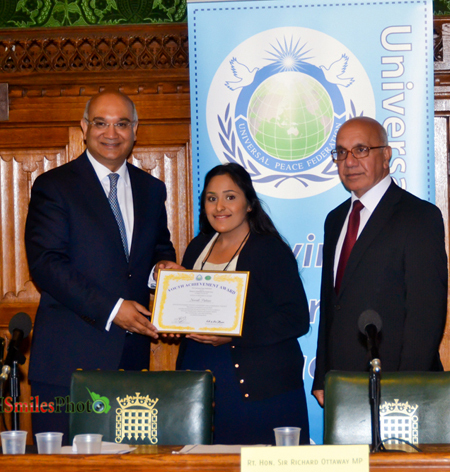 Rt Hon Keith Vaz MP presented the award to Neerali and praised her effort. He commented that the audience was far more diverse than the Parliament as a whole where there are 27 BEM MPs and 77 BEM Peers. He hoped this was a sign of the future. He was happy to see many in the audience who are making big efforts to make an improvement in their communities. He added that he would like to see more BEM representation in Parliament in future. Stephanie Coombs spends a good portion of her time volunteering to better the lives of others. Throughout 2007 to 2009, Coombs worked with a charity Washington Aids International Teens, or WAIT, which is an HIV/AIDS awareness program that uses visual arts to get their message across. With WAIT, Coombs performed all around the UK and abroad. Also from 2007 to 2009, Coombs was in charge of a South London church youth grouping called HARP, where she organised workshops and service projects. In 2008, Coombs travelled to India with the Religious Youth Services helping a children’s home. In 2011, Coombs worked in California with LA Volunteers at the largest homeless shelter in America. Coombs has also worked in volunteer projects around her hometown Croydon, such with the Croydon Refugee Centre where she looked after children while their parents sorted things out. Coombs has also participated in Clean the Thames Project and has travelled to Holland to work with the Religious Youth Service in Utrecht. The Rt Hon Sir Richard Ottaway MP after presenting the YAA praised Stephanie's humility. He said he was surprised at her diverse volunteering experience in several different nations already as such a young age. He speculated on her great future potential. Tally Koren, the Fringe Award winner for Best Singer-Songwriter performed her song 'Free Will' during the programme as part of a campaign to inspire people to fulfill their dreams. Her distinctive, emotive voice and sophisticated stage presence have received great critical acclaim, and she has performed at such prestigious events and venues as The Tate Britain, The Marbella Film Festival and The House of Lords. She has also performed in front of such dignitaries as Israeli President Shimon Peres. 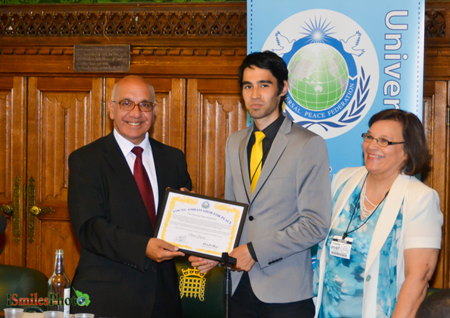 Oliver Davies received a Youth Ambassador of Peace award for his work as the current Director of the Youth Department of Universal Peace Federation – UK. 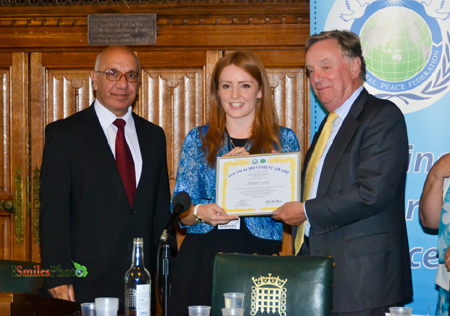 Pauline Long received an Ambassador for Peace award during the programme. She is an entrepreneur, philanthropist, fashion designer, motivational speaker, and music video director with over 25 awards. She is also the founder of Europe’s biggest award for black and ethnic personalities in entertainment, film, fashion, television and arts- BEFFTA. 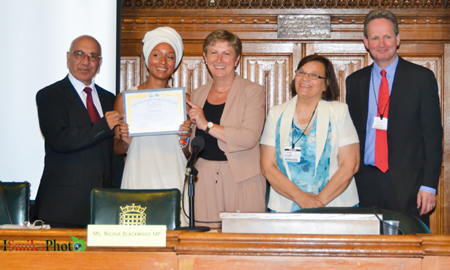 Named African woman of the year in UK and listed in Black Women in Europe Power List. She’s a TV presenter on The Pauline Long Show SKY 182. She also nominated two of the Youth Achievement Awardees, Jermain Jackman and Keith Matthews Ssewamala.